I kinda disappeared there, huh? Well, I completed my Read-a-thon around 1 am, but I made sure I finished my book this morning. All things considered, I did rather well for my relaxed Read-a-thoning. I read 2 full books: Cheerful Weather for the Wedding and Garden Spells, plus half an audiobook. I call it a success! I had some fun with the mini-challenges too. Now for the End of Event Meme! Which hour was most daunting for you? None were actually, I know my limits. Could you list a few high-interest books that you think could keep a Reader engaged for next year? Garden Spells definitely kept my interest. Do you have any suggestions for how to improve the Read-a-thon next year? Nope! What do you think worked really well in this year’s Read-a-thon? Personally, it was my relaxed approach to it. Which did you enjoy least? I liked them all. How likely are you to participate in the Read-a-thon again? What role would you be likely to take next time? As long as I can swing it, I will be a Reader again. Those were my not so interesting answers. Big thanks to the Read-a-thon organizers for another fun event! In non-Readathon news, I added two more books under my reading belt. I finished Train Like a Mother and the audio version of Anna and the French Kiss. Trish is hosting a pinteresting challenge (see what I did there?) Pin It and Do It. I'm signing up! I plan on doing the Pinterested Level, which means I'll do 4-7 things that I've pinned on Pinterest. This should be fun! So, that's it for now. I'm going to relax with some Downton Abbey. First congrats on the readathon! I didn't get to participate this time but hope to be back in the fall. Relaxed seems to be the perfect way of doing things. Second--thanks for signing up for the Pinterest challenge! Hope it's a lot of fun and people actually get some of those things accomplished (myself especially!). I loooooved Garden Spells. I read it readathon style on a plane. lol It was my first Sarah Addison Allen undertaking, and it's one I'd really like to re-read. Sounds like you had a very successful readathon! I didn't join in and I had a horrible weekend (but not because I wasn't reading). Next time, I think I'll just say, "Forget the housework; I'm reading." Love, love, love Garden Spells. It's still my favorite SAA book, although I love them all. Wasn't Cheerful Weather For a Wedding thought provoking? An oxymoron, to be sure, but I've been thinking about it since finishing it this weekend...so much sorrow, really, in what the characters couldn't say to each other. Or, wouldn't. I love the Pinterest challenge! 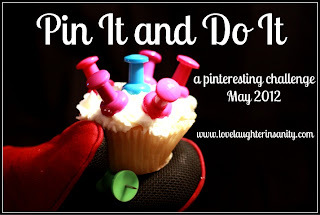 I'd sign up, but the Pinterest projects I have are HUGE (like the advent calendar I'm currently working on).